there may be no jial and only apologizing letter. But, if it’s more than three days, it should be out. I don’t want to be forgotten in jail. According to his wife with whom we talked, Fouad's arrest was directly linked to his blogging activities. He may remain in custody for a one-month investigation period. After that his family will be allowed to visit him and be informed about his case and the possible charges that might be brought against him. Fouad is apparently being held, without charge or trial, at the Ministry of Interior's security service (al-Mabahith al-‘Amma) headquarter in Jeddah. He has been arrested at his office in Jeddah and had been led to his home where police confiscated his laptop computer. This is not the first time that Fouad has run into trouble with Saudi authorities. Last year, Fouad was questioned by plainclothes police and was forced to shut down his blog. After a hiatus of few months, Fouad decided to continue blogging. 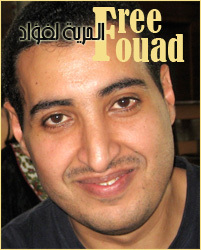 Several bloggers and activists are organizing an online Free Fouad campaign at freefouad.com to call attention to Fouad. As so far, a support group created on Facebook for Fouad has gathered 295 members. In a statement issued on December 24, 2007, The Arabic Network for Human Rights Information condemned the “unjustified detention” of blogger Fouad Alfarhan and urged the Saudi authorities to reveal the reason of arresting him. “When the Saudi authorities arrest a young man writing maturely and is against terrorism and calls for reformation, it is a serious indicator for how far are the fanatic and those opposing freedom of expression and reformation are taking over in Saudi Arabia,” the executive director of the Arabic Network for Human Rights Information, Mr. Gamal said.